It might not be as glamorous as Christmas or as flashy as Halloween, but the last Friday every April is a time for all cat owners to celebrate a very important holiday–National Hairball Awareness Day, which falls on April 26th in 2019! Well, perhaps “celebrate” is the wrong word. National Hairball Awareness Day serves as an annual reminder for all friends of felines to learn a bit more about hairballs and evaluate the health of their cats. If you’ve ever heard your cat hacking and gagging in the middle of the night, you may already be painfully aware of hairballs. But did you know that they could indicate problems with your cat’s health? 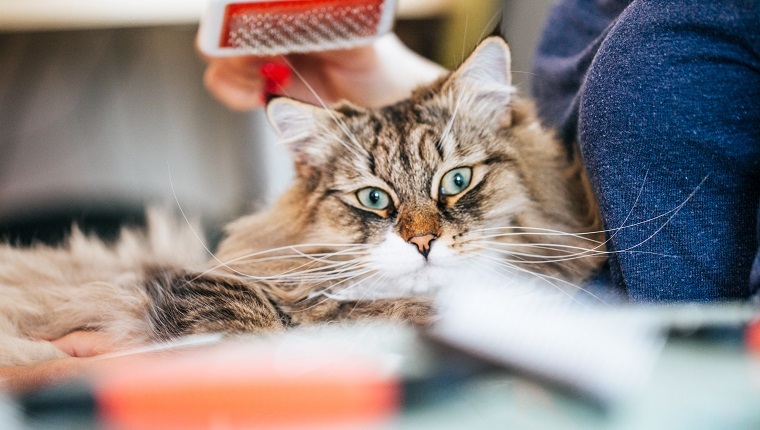 Here’s what you should know about hairballs–and don’t forget to spread what you learn on National Hairball Awareness Day! Veterinarian and clinical coordinator for the Community Practice service at Colorado State University’s James L. Voss Veterinary Teaching Hospital, Dr. Rebecca Ruch-Gallie, explains that hairballs—better known in the veterinary world as “trichobezoar”—are essentially wads of hair that accumulate in the digestive systems of animals that typically groom themselves. Cats, rabbits, cattle, and even llamas can get hairballs, she explains. 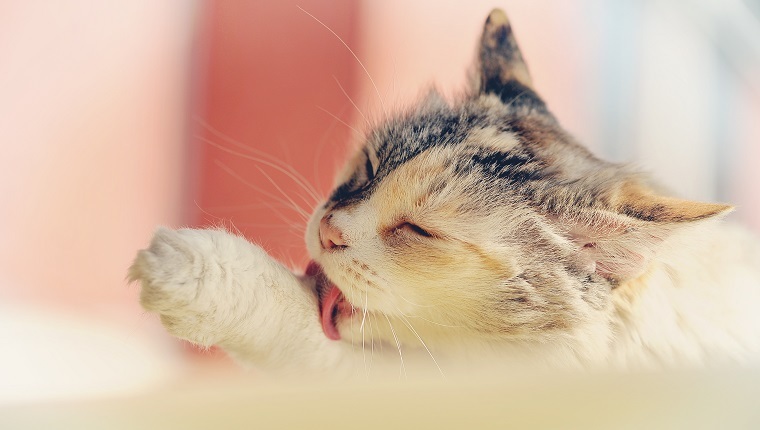 As for cats, the little barbs on the tongue do more than make a cat’s tongue feel scratchy like sandpaper; they strip away dead undercoat hairs during a cat’s grooming sessions. The loosened hair can end up in the gut, and most often it travels through the entire digestive system and is expelled into the litter box. The amount of hair a typical cat swallows while grooming tends to vary. 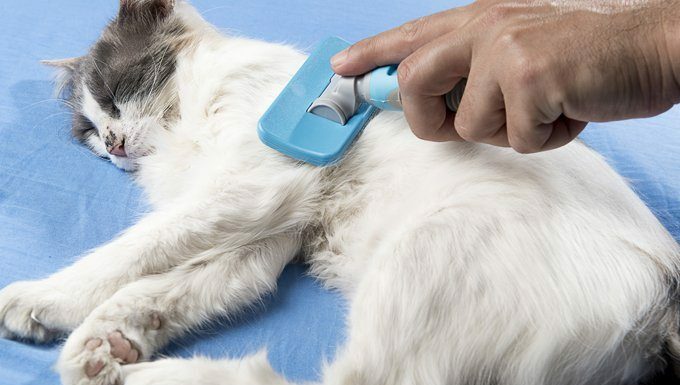 Dr. Brunt says that cats with some skin conditions, flea allergies, or food allergies might feel the need to groom themselves more often, and may ingest more of their own hair. And Dr. Ruch-Gallie explains that cats who are older and long-haired might be more prone to hairballs. While some cats go through their whole lives without coughing up a hairball—which Dr. Brunt says is totally normal—others aren’t so lucky. “If [the hair] doesn’t go past the stomach, past the pylorus, then it just kind of keeps getting bigger and bigger, and it forms a hairball,” Dr. Brunt explains. If the wad of hair is stuck in the stomach, soaking up bile, it will eventually trigger regurgitation. But should cat owners be worried if their kitties cough up a hairball? Not in all cases. When Should You See The Vet About Hairballs? When might hairballs indicate a serious health problem? If you notice your cat is producing hairballs quite frequently, or if you observe excessive gagging, coughing, hacking, vomiting, a loss of appetite, lethargy, unusual stool consistency—including diarrhea, constipation, or a strangely excessive amount of hair in the stool—then it might be best to consult a licensed veterinarian. Cats who frequently regurgitate their hairballs may have an underlying medical condition such as inflammatory bowel disease or even cancer, according to the ASPCA. Cats who experience difficulty in regurgitating hairballs should see the vet, also, as the hairball might cause an obstruction. In fact, some hairballs are so severe that they require surgical removal, Dr. Ruch-Gallie says. How Can You Prevent Hairballs In Your Cat? There are plenty of things you can do to decrease the chances your cat will cough up a hairball. Dr. Ruch-Gallie suggests helping your cat out by grooming them with a brush. “Pick a soft, bristled brush or a cat grooming mitt,” she says. Petroleum-based cat treats can help cats pass their hair the normal way—through their stool—by lubricating their digestive system a bit to keep that hair moving. Some cat foods are specially designed to reduce hairballs by improving the skin and coat health. These foods are intended to reduce shedding hair and itchy skin while also adding fiber to their diets. Make sure your feline friend is drinking plenty of water, too, as hydration tends to help keep the digestive tract in tip-top shape. Finally, because bored kitties tend to groom themselves too frequently, cat owners should work in some extra playtime. Less grooming means fewer hairballs, and that’s always a good thing. How do you prevent hairballs in your cat? Will you share what you’ve learned for National Hairball Awareness Day? Let us know in the comments below!